Located in the Northwest corner of Montana, close to the USA border with Alberta and British Columbia, there are several ways you can travel to the park. There are plenty of opportunities for exploration and adventure along the way, should you so chose, or you can make the trip as direct as possible and spend all your time with us! You can get here by railway…Amtrak has two stops close by, one at Whitefish and one at West Glacier (Belton) both fed by the Empire Builder that runs from East coast to West. You can get here by trailway.. No matter which way you approach us, you will drive through some of the most spectacular scenery in the world. Along with open, uncrowded roads and plenty of traditional Mom and Pop motels for rest stops along the East/West US Highway 2, its the perfect excuse for a roadtrip. You can reach us by airplane…Glacier Park International airport handles hundreds of thousands of visitors every Summer, with airlines offering direct flights from destinations such as Minneapolis, Chicago, Atlanta, LA, San Francisco, Seattle, Portland and Las Vegas. Airports at Missoula, Great Falls, Calgary and Spokane are all within a six hour drive. Plane, train or automobile, or a combination of all three. We don’t care HOW you get here, just GET here when you can! 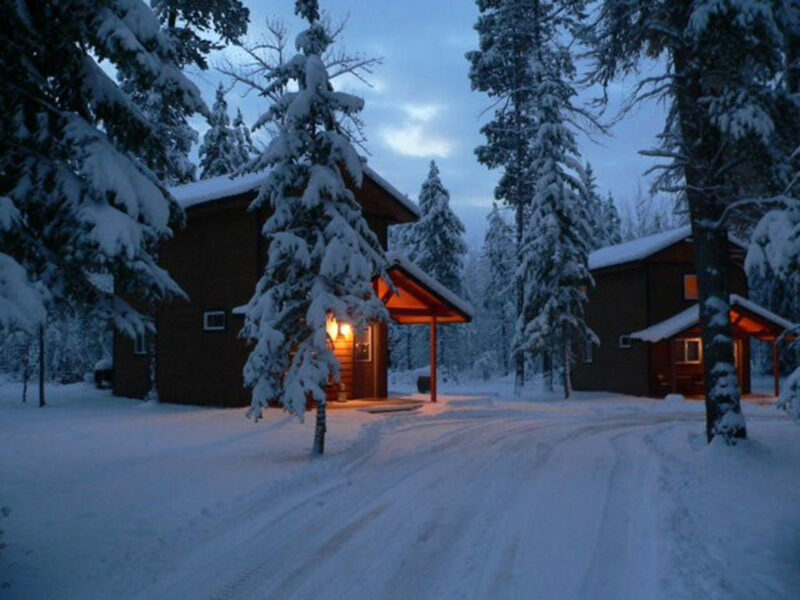 We have a selection of lodging options available for couples to get away from it all. Snuggle up around the fireplace in the lodge when you chose one of our lodge rooms, pick a Couple’s Cabin or one of our brand new Northfork or Southfork Cabins for a little more ‘cabin-in-the-woods’ privacy. We wish each and every one of our guests a warm and wonderful holiday season. We are grateful for the stories you have shared with us and the memories you have helped us to make of our little business and this beautiful corner of the world. Thank you for being a part of our journey! We love to keep in touch with all your news and adventures on Facebook but, honestly, its not the same as a leisurely evening around the campfire. How about a catch-up in 2018? Have you hiked in Jewel Basin yet? Kayaked on the Hungry Horse Reservoir? Scaled Great Northern? These are all outstanding ‘second-time’ experiences that are not to be missed. Arguably even more beautiful than Glacier National Park, just as close in location to us and less well-known (so fewer crowds). We know it, there’s just too much to do! The most common thing we hear from guests is that they wish they could stay longer. Sooo…to help with that, we are offering discounted weekly rates so that guests can take the time to extend their stay and explore beyond Glacier. 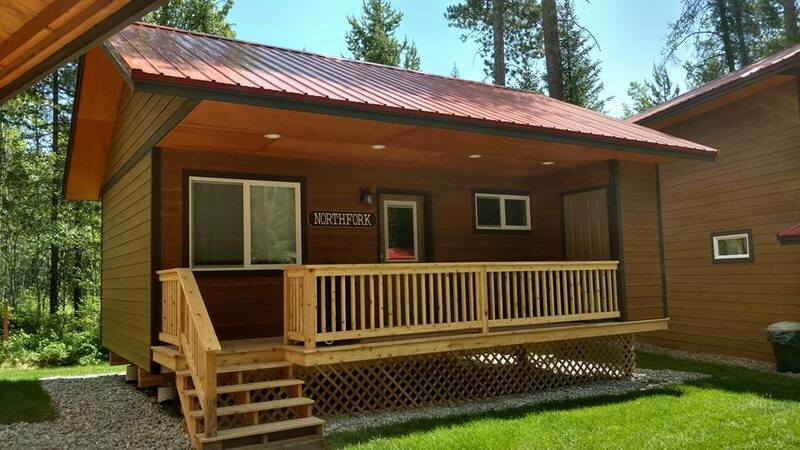 And, we built four new cabins so more of you can visit at once! Quick recap… discounted rates for longer stays, so much more still to see and do, and more cabins to try. Star is on tenterhooks waiting for you to say YES! The archetypal ‘cabin in the woods’ is synonymous with retreat from the world-at-large and, with recent events in Las Vegas, I would venture to guess that many of us are asking the important questions about life and re-examining our purpose and direction. Our corner of Montana has many residents who originated from out of state – you would think that their reasons for moving here would be as diverse as their former lives yet, there is a common theme heard over and over when asked how they ended up in this area. They were at a crossroads, needing healing from trauma in their lives, to slow down and experience the important things that should not be taken for granted (but so often are in our crazy-busy lives). 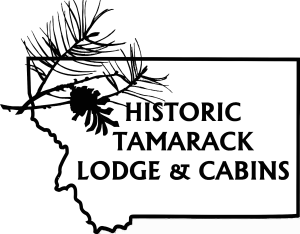 We appreciate that not everyone can pull roots and move their lives like many of us have been able to do, so one of our goals at the Historic Tamarack Lodge and Cabins is to provide a taste of this to all our guests passing through. We provide the cabin, the woods and the hospitality. We let Glacier National Park and nature do the rest. Are you feeling that pull to come home to your Self? 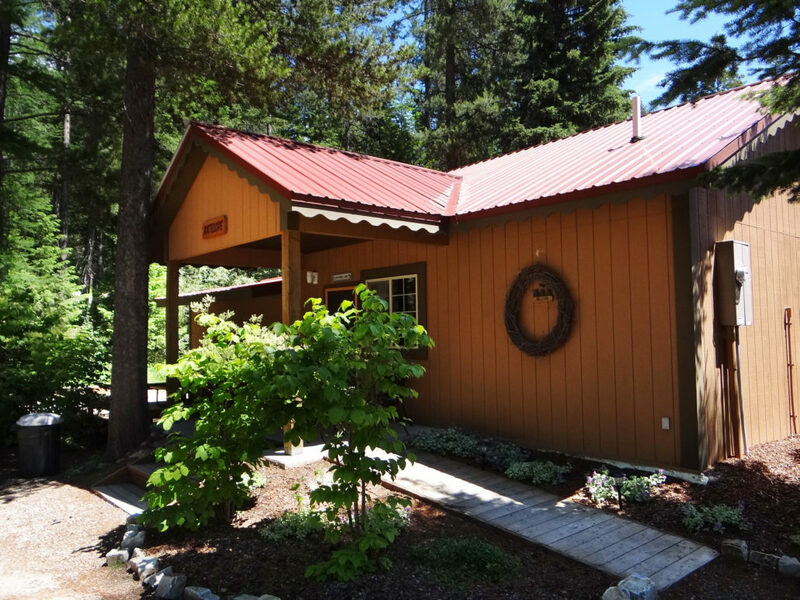 We have twenty-six different cabins all waiting to welcome you, all year long. Big cabins, little cabins, historic cabins, new cabins, cabins with balconies overlooking the forest, cabins with decks overlooking the mountains, cabins with sunset views. Take a train, plane or automobile and come visit with us. Just leave your troubles behind. Glacier National Park, business as usual! We are aware that there is currently a media frenzy concerning wildfire in our area and in Montana as a whole. Wildfires are a natural and normal part of our Summers here and we adapt to them in the same way that we adapt to snowstorms in Winter, or any other natural event. We have outstanding wildfire management teams that are fully competent and capable of doing everything possible to limit the effect of wildfire on property and people and we leave the management of the wildfire situations to them whilst everyday life continues as normal. As I am typing this I am sitting on my deck located within a mile of the Park entrance. I can see Apgar mountain and Belton Hills, and also the occasional helicopter flying overhead towards the Sprague fire. The sky is blue. The sun is shining and there is only a slight blur of haze over the peaks in the distance. However, if I turn the tv on, the news stations (that aren’t covering the devastation in Texas) paint a picture of Montana as a blazing inferno with zero visibility due to smoke and wildfire conditions. It is true that there are areas that have been badly hit by fire, it is true that the Sprague Fire is burning in Glacier National Park. HOWEVER, Montana is larger in size than the country of Germany. Less than 1% of this is currently affected by wildfire. 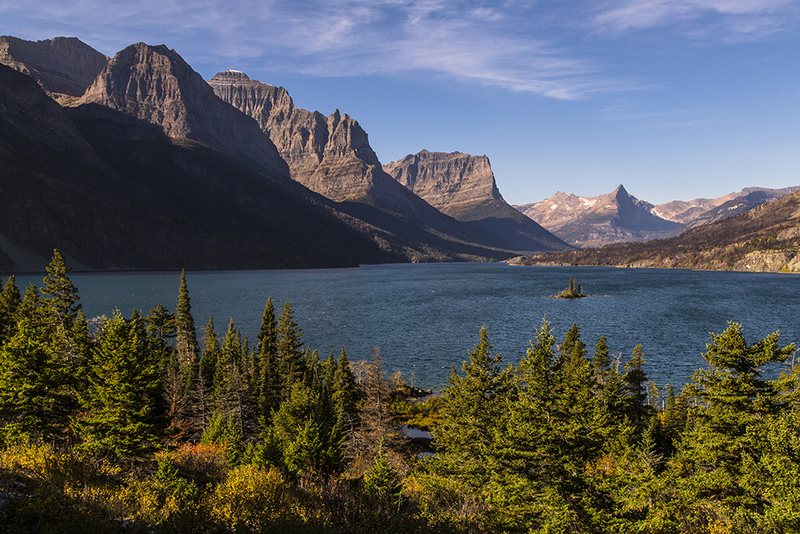 Glacier National Park is more than one million acres of wilderness. The fires are affecting 5,000 acres of this. That’s 0.5%. There is still plenty to enjoy in the Park, from the newly restored spiral staircase at the lodge in Many Glacier, to hiking at Two Medicine. Enjoy a boat trip on St Mary Lake and hike to Virginia Falls to see how quickly an area regenerates after fire. The largest lake west of the Mississippi, Flathead Lake, is approx 40mins away with its lakeshore communities of Bigfork, Lakeside and Polson offering microbreweries, restaurants, antique stores and art galleries alongside fishing trips, SUP, kayak and boat rentals. You can take a gondola ride to the top of nearby Whitefish Mountain for views into Glacier National Park, across the Flathead Valley and even into Canada. For indoor entertainment we highly recommend the Miracle of America Museum and Kalispell’s Conrad Mansion. These are just a few examples of places to see and things to do during your trip. Your vacation will still be an outstanding experience of America’s natural beauty and wilderness, and you will still experience that Montana hospitality we are famous for. Check your sources. If you are worried about a particular fire – turn off the tv and check inciweb for the latest, most accurate information; look at the webcams in the Park; and talk to us about what is actually happening right here. Blue sky, warm sunshine, relaxed pace of life, and acres and acres of wilderness. There is no need to change your plans. If things should change and we are in ANY danger at all, the fire management teams will let us know and we will let you, our guests, know. We take seriously our roles as ambassadors of the Treasure State and honor the reputation of Montana as a tourist destination. Our loyalty is to you and the State we live in. Turn off the tv and talk to us. http://www.historictamaracklodge.com.php56-19.dfw3-1.websitetestlink.com/wp-content/uploads/2016/02/Tamarack-1-BLACK-300x234.png 0 0 Dominique http://www.historictamaracklodge.com.php56-19.dfw3-1.websitetestlink.com/wp-content/uploads/2016/02/Tamarack-1-BLACK-300x234.png Dominique2017-09-03 17:03:242017-09-03 17:03:24Glacier National Park, business as usual!